The future of the non-practicing entity business model as it currently exists is uncertain. With many headwinds facing NPEs, including AIA provisions for IPR and CBM invalidity proceedings, state and proposed federal legislation aimed at aggressive NPE tactics, and the limited scope and viability of business methods patents after the Supreme Court’s decision in Alice Corp., many NPEs are questioning the future of their patent monetization efforts. One thing is certain however, NPEs as a group are massive patent holders, and opportunities to extract revenue from these patent portfolios may still exist, just possibly not in their current offensive litigious form. 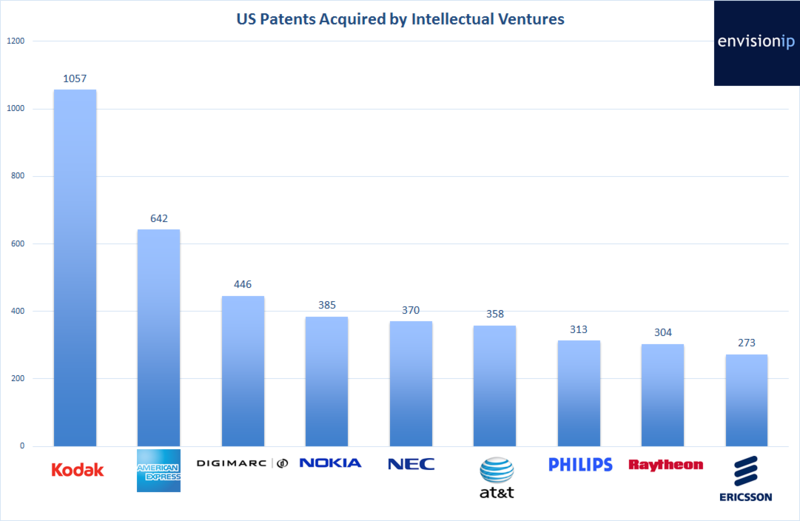 Envision IP analyzed Intellectual Ventures’ US patent portfolio, which is publicly listed by the company on its website. IV claims to have “70,000 patents and patent applications”, and we identified 19,559 US patents assigned to IV or to one of its many subsidiaries. The goal of our analysis was to determine the interplay between IV and many large Fortune 1000 companies, specifically to understand how many patents acquired by IV were originally owned by these Fortune 1000 companies. IV has a broad and diverse US patent portfolio, with roughly 6,500, or 34%, of its patents previously owned large technology companies, as well companies in the defense, consumer products, automotive, and chemical industries. Approximately 2% of IV’s US patents were originally owned by academic institutions and technology transfer offices. The portfolio is heavily focused on wireless, internet, and semiconductor technologies, and roughly 40% of the portfolio has claims directed to software and business methods. While many large technology company patents are owned by IV, the portfolio does not appear to contain any patents originally owned by Apple, Google, or Qualcomm. In addition, there does not appear to be a strict correlation between companies invested in IV, and their contribution of patents to IV’s portfolio (while many investors’ patents do appear in IV’s portfolio however, namely Nokia, Verizon, Microsoft, and Sony). Also interesting is that only 268 of the 19,559 US patents owned by IV have a litigation history, representing less than 1.5% of the patents. IV presumably generates licensing revenue from patents that it may or may not have enforced in court however. The largest group of patents is from Kodak, with 1,057 patents now assigned to IV. These patents were acquired as part of Kodak’s court-ordered patent sale during the company’s bankruptcy proceedings. IV and RPX led a consortium of companies to acquire the Kodak patents that were for sale, and IV now reportedly earns licensing revenue from these patents. In addition to the Kodak patents, IV’s portfolio includes 642 patents originally owned by American Express, with the vast majority of these patents related to various methods for conducting electronic and online financial transactions. One of these patents, US 6,182,894, has been asserted by IV against HSBC, Capital One, Bank of America, Fifth Third Bancorp, and other banking institutions. IV reported a license agreement with American Express in 2011, and these patents may be part of that agreement. The next largest group of patents was acquired from Digimarc, a publicly traded company focused on digital watermarking technologies. The patents relate to audio and video encoding and security, as well as file transfer and mobile multimedia technologies. We did not identify any litigation activity by IV with respect to the Digimarc patents. IV’s portfolio also contains 385 patents originally owned by Nokia. The majority of these patents relate to wireless signal transmission protocols, mobile device functionality, and content streaming and transfer. Two of the acquired patents were asserted by IV against AT&T Mobility, T-Mobile, Nextel, Spring, and Motorola Mobility. The enforcement activity is interesting, as IV has acquired 358 patents from AT&T, and 84 patents from Motorola. The next largest group of patents is from NEC Corporation, with 370. The patents relate to LCD and semiconductor technologies for display panels. IV asserted one of these patents, US 6,435,686 against Canon and Ricoh. This particular patent was acquired by NEC from The Ohtsu Tire & Rubber Company. Regarding the AT&T patents owned by IV, these patents cover a wide array of technologies including cloud computing and remote file transfer, email and messaging technologies, wireless transmission protocols, and various technologies related to content delivery on mobile and set-top devices. Four of these patents have been asserted by IV, against a diverse group of defendants including JP Morgan Chase Bank, Suntrust Bank, Symantec Corporation, and Erie Family Life Insurance Company, among others. The list of companies cover a broad scope of technologies and industries, and the patents acquired by IV reflect this diversity. IV has acquired patents related to semiconductor design and fabrication, digital imaging, electronic messaging, display systems, but also for consumer products related technologies. For example, IV controls 55 patents originally owned by Kimberly-Clark Worldwide. These patents cover RFID tag technology, and software for sales force management, order processing, and order fulfillment. Also interesting to find many defense contractors as the previous owners of patents now controlled by IV. These defense contractors include Raytheon Corporation (with over 300 patents now owned by IV), BAE Systems, Lockheed Martin, and Boeing (with 23 patents now owned by IV). The majority of these patents relate to wireless signal protocols, electronics hardware, and radar systems. However, some patents are specifically directed towards missile and warhead technologies, such as US 7,143,698 entitled “Tandem Warhead”, and acquired by OL Security LLC (an IV subsidiary) from Raytheon. We did not identify any of these defense contractor patents involved in litigation by IV. While Ericsson appears to have contributed 273 patents to IV’s portfolio, the vast majority of these patents were originally owned by Telcordia Technologies, which Ericsson acquired in 2011. We identified only 17 patents actually previously owned by Ericsson that are now controlled by IV. Also, Daimler AG is the only automotive manufacturer that we identified, with 123 of its patents now owned by IV. We cross-referenced a Bloomberg article dated September 4, 2014 that details IV’s investors and defendants. 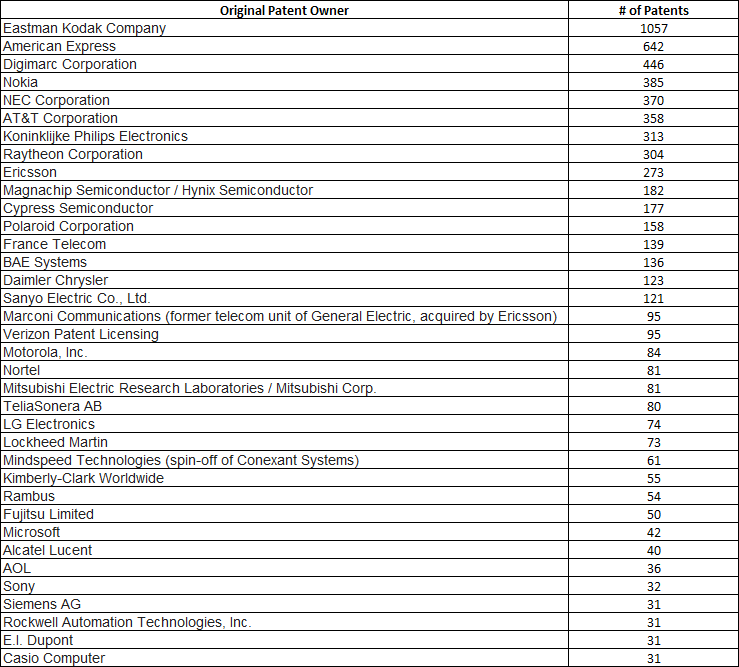 Regarding the major technology companies listed as investors, not all of these companies appear to have “contributed” patents to IV’s cause. For example, IV owns zero Apple patents and only 3 Cisco patents. However, IV’s portfolio includes 345 Nokia patents, 95 Verizon patents, 42 Microsoft patents, and 32 Sony patents, all companies that are named as IV investors. Interestingly, JP Morgan Chase is an investor in IV (as a trustee for White Plaza Group Trust), however, JP Morgan is also named as a defendant in 5 patent litigation cases initiated by IV. In addition, IV’s portfolio only contains 9 patents originally owned by IBM, which is surprising given the many recent high-profile patent sales by IBM to Facebook, Twitter, Alibaba and others. The portfolio also contains only 4 patents from Samsung Electronics Co. Ltd., compared to 74 from its rival LG Electronics. Regarding the substance of IV’s US patent portfolio, surprisingly, we identified only 1,793 (~10%) patents listed Class 705 (the business methods class). However, 7,809 (~40%) of IV’s patents list a software related classification. Thus, presumably at least 40% of the portfolio has claims related to software or methods, and which could be at a heightened risk for invalidity post-Alice Corp. and AIA. Aside from corporations, 387 of IV’s patents were originally owned by academic institutions, such as the California Institute of Technology (49 patents), the University of Texas System (28 patents), Florida State University (8 patents), and the University of California (8 patents), to name a few. The UT system is also named as an IV investor. Going forward, IV may likely be able to continue its licensing efforts, as the company appears to own many valuable patents that were previously, or are currently, being commercialized by their previous owners and other players in those respective industries. However, with such a large emphasis on software patents in the portfolio, aggressive enforcement of those patents may be stifled as the Federal Circuit continues to interpret the Supreme Court’s Alice Corp. decision, and until there is more clarity regarding provisions such as fee-shifting in the proposed Congressional “anti-troll” legislation. Interesting research! Did you various acquisitions when grouping the patents? e.g. Samsung acquired AST Research!